Every appointment is made of three ingredients: the staff, the service, and the customer. If you've already got your staff and services set up, then it'll only take a few seconds and a few clicks or taps to book an appointment. 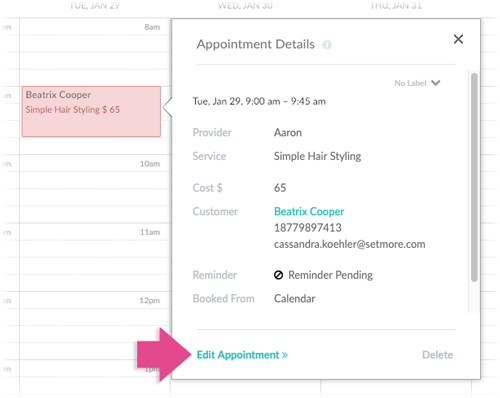 Most functions related to creating appointments can be easily accessed from the pink (+) button on your Calendar tab. These instructions are the same for both Setmore iOS and Android apps, although there may be subtle differences in wording here or there. First, on the Calendar tab, tap the pink (+) button and select +Appointment. Then, Select the service, service provider, and choose a date & time. Note: Time slots outside of your normal working hours will appear in grey, whereas time slots during your working hours will appear in white. You can still select greyed-out times and book during off-hours. Select the customer or create a new customer. Review the details of the appointment, then tap Done in the top right to confirm the booking. The appointment will appear on your calendar, and any email notifications (if activated) will automatically send to the staff provider and customer. To edit, reschedule, or cancel an appointment, first tap on the appointment block on your calendar. 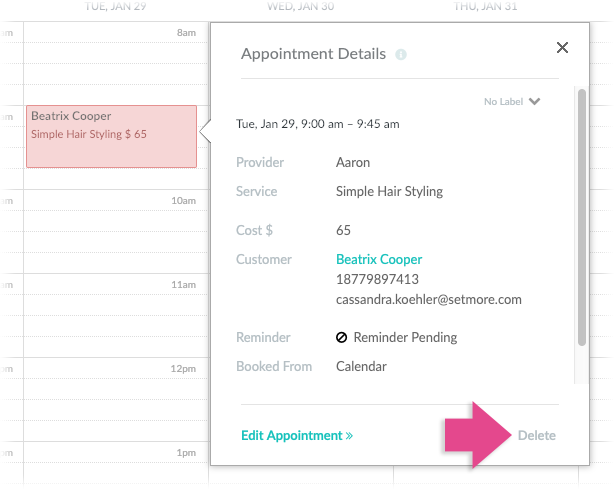 The Appointment Details menu will list out all the essentials: date & time, customer, service, recurring cycle (for Setmore Premium users), comments, and labels. Tap any field to modify it. To reschedule the appointment, tap the date & time box. Select a new date and time and save your changes. To cancel the appointment, tap the menu dots in the top right and tap Delete, then confirm to complete the cancelation. The Setmore web app is available to all users and can be accessed at https://my.setmore.com. Any appointments you book in the web app will sync to the mobile app, and vice versa. Watch our how-to video to see how it's done, or follow the instructions below. On the Calendar tab, click an open time slot to start the appointment. The Appointment Details menu will appear. Select the service from the dropdown menu and click "Continue." The next step is to identify the customer. You can either search for an existing customer, or add a new customer. Once the customer is identified, you'll see a summary of their details. To complete the booking, click "Save Appointment." The appointment is now booked. To reschedule an appointment, start by clicking the appointment in your calendar. Then click Edit Appointment in the bottom left of the details menu. Use the Date and Time dropdown menu to change the date and time of the appointment. (You may also change the service or specify a new staff member). Click Save Appointment when you're finished. 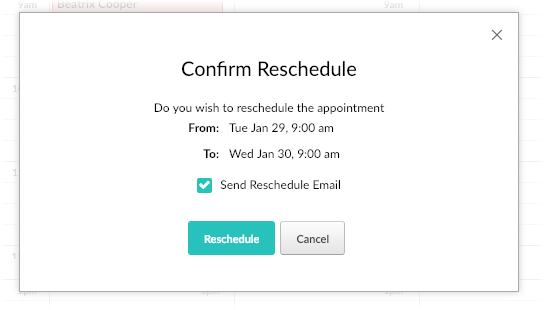 In the Setmore web app you can also reschedule an appointment by dragging and dropping it into a new time slot. Click on an existing appointment and drag it to the new time slot. Once you let go, a message will prompt you to confirm the action. To delete an appointment, start by clicking on the appointment in your calendar. Then click Delete in the bottom right corner of the details menu and confirm.